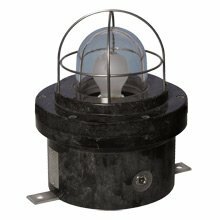 These certified steady beacons have been designed for use in potentially explosive atmospheres and harsh environmental conditions. The enclosures are suitable for use offshore or onshore, where light weight combined with corrosion resistance is required. The beacon housing is manufactured completely from a U.V. stable, glass reinforced polyester. Stainless steel screws and mounting bracket are available ensuring a totally corrosion free product. Class I, Div. 2, Groups C & D.
2 x M20 or 2 x 1/2" NPT cable entries.